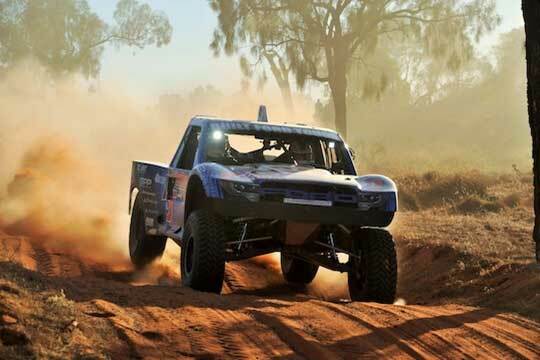 Shannon and Ian Rentsch will be out to claim an historic ninth Australian Off Road Championship. Eight-time Australian Off Road Champions Shannon and Ian Rentsch will line up at the Hindmarsh Shire Rainbow Desert Enduro in north-west Victoria this weekend, hoping to come away with an historic ninth national title. 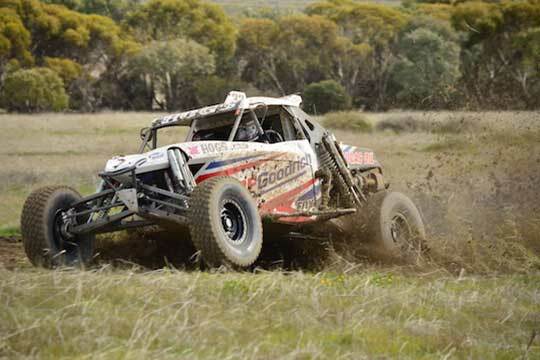 At what could be considered their ‘home’ event, the father-son team from Warnambool, Victoria hold a 106-point lead heading into the third and final round of the BFGoodrich CAMS Australian Off Road Championship (AORC). Already holding the record for the most Australian titles since the inception of the AORC in 1981, in typical Rentsch fashion, driver Shannon is keeping a low-key approach to the Rainbow Desert Enduro. “It’s kind of like a new track, we didn’t get far last year, we had an accident on the first lap and didn’t finish. “We’re really looking forward to getting back there and I’ll probably go pretty slow past that tree I hit last year,” Rentsch joked. As always, preparation has been key for the Rentschs. “We’ve done a lot of work on the car since Finke. A lot of prep has gone into making sure the car is right. This race is the longest race on the calendar, probably the longest race in Australia at the minute, so it’s pretty important to make it to the finish without any trouble. Toby Whateley sits second in the 2018 BFGoodrich CAMS AORC pointscore heading to Rainbow. Sitting second in the AORC pointscore, Toby Whateley will be hoping to make history of a different kind - becoming the first SXS Turbo to take an outright win in the AORC. The South Australian young-gun wrote himself into the record books at round one of the championship in May, becoming the first SXS Turbo to take an outright win in section one of the St George 399. Still in with a shot at the title, Whateley says he’ll be taking a steady approach to the Enduro . “We think we will take it easy and try and finish where we are in the Championship and not let anyone overtake us,” Whateley said. 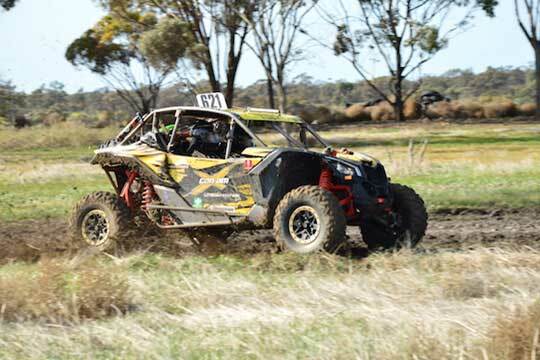 Recent changes made to the 75-kilometre course should promote closer racing between the classes but Whateley believes the buggies will still have the upper hand over his Can-Am Maverick. Like Rentsch, Whateley also failed to finish the inaugural event last year, but still rates the Rainbow Desert Enduro highly. With a quality field of 44 entries, any number of teams could challenge for the win - in the Pro Buggies, Josh Howells will be looking to continue his stellar debut season in the AORC and off-road legend Mark Burrows should never be discounted. 2017 Rainbow Desert Enduro winners Greg Gartner and Jamie Jennings (above at the 2018 Tatts Finke Desert Race). The Extreme 2WD class will be one to watch, with winners of last year’s event Greg Gartner and Jamie Jennings back to defend their title. They will be up against Justin Watt, third outright last year and the super-competitive Beau Robinson in the OBR Geiser Bros Trophy Truck, not to mention Brett Taylor who will be out to grab a swag of points and the class title. The always exciting Alan Dixon will be pushing the Moneybox Racing Southern Cross to the limit in a effort to claim the Prolite class title ahead of Ally Howells, with the AORC new-comer enjoying a successful debut season. And a gaggle of SXS Turbos will be chasing class points leader Whateley - the likes of Jeff McNiven, Nathan Chivers, Greg Campbell and Russell Newman are in a battle-royale for the minor placings, just 69 points separating second through to fifth. Supported by Hindmarsh Shire, Victorian Government, Graincorp and the West Wimmera Health Service, the Rainbow Desert Enduro kicks off on Friday afternoon with scrutineering in Rainbow’s main street. On-track action starts at 9am on Saturday morning with all competitors completing an eight-kilometre prologue before Saturday afternoon’s three-lap race. Sunday’s gruelling five-lap race will start at 9am. Visit www.aorc.com.au across the weekend for results, news and video of the Hindmarsh Shire Rainbow Desert Enduro.